Targeted drug delivery offers the hope of teaching old dogs new tricks, repurposing existing treatments by deploying them to previously inaccessible sites of pain. In a paper published July 18 in Science Translational Medicine, Michael Cima and colleagues at Massachusetts Institute of Technology in Cambridge, US, and at Taris Biomedical, Lexington, Massachusetts, US, report the results of a small, early-stage clinical trial of a novel device that delivers a steady supply of the local anesthetic lidocaine into the bladder for two weeks at a time. The investigators report that the treatment alleviates pain and other symptoms in patients with moderate to severe chronic bladder pain, and that it also reverses severe inflammatory bladder damage. “This is an important contribution to show how targeted drug delivery may produce significant therapeutic benefits with limited systemic exposure and limited adverse events in a difficult-to-treat patient population,” said William Schmidt of NorthStar Consulting, Davis, California, US, an expert in drug development who was not involved in the study. Interstitial cystitis/bladder pain syndrome (IC/BPS) is a chronic disorder characterized by pain, urgency, and frequent urination up to 50 to 60 times per day. Catheter administration of lidocaine directly into the bladder (intravesical delivery) has been shown to acutely relieve pain and urgency in patients with IC/BPS. However, symptoms return in as little as one hour due to rapid dilution and loss of lidocaine with urination, and prolonged symptom control requires multiple administrations (Parsons, 2005; Welk and Teichman, 2008; Nickel et al., 2009). The idea of using a drug pump to continuously deliver lidocaine in the bladder is not new, but has proved a challenge. A previous trial was stopped early due to discomfort associated with the device, likely because of its size: a 10 x 15 cm pump was required to house an adequate volume of liquid lidocaine to deliver a therapeutic dose over time (see Chancellor, 2001). 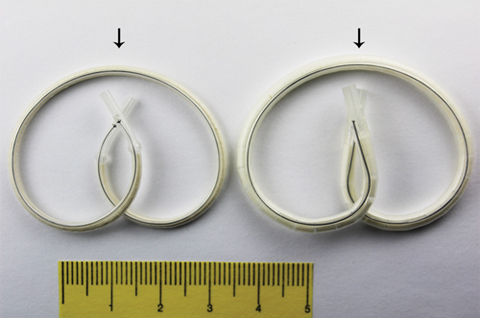 To solve the size problem, Cima and colleagues started with solid lidocaine mini-pellets, which they encased in a water-permeable flexible tube. An incorporated nickel-titanium wire allows the device to be inserted or removed from the bladder in a linear form, and to assume an easily retained pretzel shape once inside. In the bladder, water in urine dissolves the lidocaine, which is released through a small pore. The use of solid drug and a flexible form made it possible to shrink the device, which they call LiRIS (lidocaine-releasing intravesical system), to 5 x 5 cm in size. After testing in 10 healthy women showed the device was well tolerated, the researchers performed an open-label Phase 1b study in 18 women with moderate to severe IC/BPS. The women received devices containing either 200 or 650 mg of lidocaine. At two weeks, women in both groups reported reduced pain and urgency. Serious adverse effects included bladder pain in one patient in the 200 mg cohort and urethral pain in one patient in the 650 mg cohort. All other adverse events were considered mild to moderate for both groups. The result that even women with diseased bladders reported few problems with the device is significant for patients with chronic urogenital pain. “IC/BPS affects the lives and families of patients considerably, and the most exciting thing is that patients with inflamed bladders can tolerate this type of therapy,” said Cima. Surprisingly, there was evidence of healing of inflammatory lesions in biopsied bladder tissue, and continued symptom relief for several weeks after LiRIS removal. “These [results] were not expected by the authors or by this reader,” said Schmidt (read more in Schmidt’s comment at the end of this story). Although these data suggest that two weeks of lidocaine treatment using the device has the potential for long-term symptom reduction and reversal of bladder damage, this evidence is from a small, open-label cohort study, and remains to be confirmed in a larger, placebo-control randomized control trial. Additionally, future studies will be needed, including longer follow-up of patients and determination of the feasibility of reinsertion in patients who might need multiple rounds of treatment to control symptoms. The maker of the device, Taris Biomedical, Lexington, Massachusetts, US, is currently conducting a placebo-controlled Phase 2 randomized trial to evaluate efficacy and further define which subgroup of patients would benefit the most from the therapy. According to coauthor Julie Lekstrom-Himes of Taris, the LiRIS technology has the potential to translate to other bladder disorders, including overactive bladder and bladder cancer. Other possibilities in the pain area are pain relief in people with kidney stones, and control of pain after procedures such as prostate removal, Cima said. Continuous intravesical lidocaine treatment for interstitial cystitis/bladder pain syndrome: safety and efficacy of a new drug delivery device. Sci Transl Med. 2012 Jul 18; 4(143):143ra100. The study shows a level of efficacy in a difficult-to-treat pain syndrome and a novelty of drug delivery with the Taris LiRIS device, i.e., targeted sustained local anesthetic drug delivery to the bladder, evidence of onset within one day and peak efficacy within three days, with minimal absorption of lidocaine into the systemic circulation. It’s also important to note initial evidence of sustained efficacy and local bladder wall healing that lasted for weeks after product removal. This was not expected by the authors or by this reader. At the same time, this should be viewed as a communication with limited numbers of patient exposures in an open-label setting. This is typical of a Phase 1b trial that is designed primarily for safety-tolerability and to address initial efficacy issues that are important to the design of double-blind Phase 2 studies in the target patient population. Since there was no placebo control or no-treatment control in the Phase 1b IC/PBS patient population, the study was not designed to address issues of spontaneous reductions of pain that often occur after flare within this chronic pain population. Flares are often seasonal (highest during allergy season) and associated with variations of the menstrual cycles of female patients. The device itself should be viewed as somewhat analogous to the Alzet mini-pumps that many of us have used for preclinical studies, where liquid drug product is released through a micro-orifice via osmotic action of tissue fluid that enters the outer rigid shell of the implanted pump in a time-controlled manner and swells a dry powered substance located between the outer shell and the inner, non-permeable drug reservoir. In this more elegant rendition, solid lidocaine pellets provide both the osmotic force and the dissolved drug substance that is driven through the orifice of the device. The product shows an inverse dose-response curve, where the lower dose of lidocaine (250 mg) produced consistently lower pain scores and urgency scores than the higher dose of lidocaine (650 mg). The authors explain this by revealing that the product with the larger dose of lidocaine was also a physically larger device that may have caused more physical discomfort than the smaller device. This needs to be worked out in their current double-blind Phase 2a study that will presumably evaluate one or more doses of study drug versus similarly sized placebo devices. The authors state that the plasma exposure to lidocaine is “500 to 1,000 times below plasma concentrations reported to be toxic in humans.” To put this in perspective, application of three Lidoderm 5% lidocaine patches that are approved for treating post-herpetic neuralgia (PHN) pain produced mean Cmax plasma lidocaine levels of 130 ± 60 ng/mL (Lidoderm package insert, February 2008). The mean Cmax levels reported in this study were less than 10 ng/mL for the 200 mg LiRIS device, and less than 15 ng/mL for the larger 650 mg LiRIS device. In summary, this is an important contribution showing how targeted drug delivery may produce significant therapeutic benefits with limited systemic exposure and limited adverse events in a difficult-to-treat patient population that has few effective options with today’s approved drug products.